Click on the picture to listen to "Good-Bye Dolly Gray"
Click on the picture to listen to "Good Old Collingwood Forever"
We all know the Collingwood theme song Good old Collingwood Forever . It is a song that has been sung loudly by both players and fans alike after each victory for generations, but what some may not be aware is that it is based on the music of Good-Bye Dolly Gray. 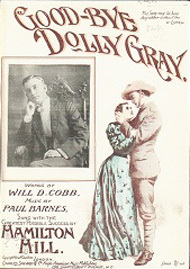 Good-bye Dolly Gray is a 'Music Hall' song from 1898 that was written by Will D Hobb, with the music by Paul Barnes (Goodbye Dolly Gray, n.d). It was first sung during the US-Spanish War of 1898, but gained popularity particularly during the Boer-War campaign of 1899-1902. It is about a soldier who must bid farewell to his sweetheart so that he can go and fight for his country, no matter what the outcome is (Goodbye Dolly Gray, n.d.). In 1906 a player named Tom Nelson, who played three games for the Pies penned the words to the music that was to become Good old Collingwood Forever (Collingwood Football Club Theme Song, n.d). It is the oldest club song of all teams within the Australian Football League (AFL). 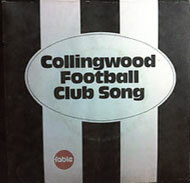 In April 1972 the Fable Singers who also recorded songs for all of the VFL clubs of the time, recorded the version of Good old Collingwood Forever that can be heard throughout the football ground when the Pies are playing (Fable Records, n.d.). The use of the line Oh the premiership's a cakewalk.. within the song has been subject to criticism given in particular to the clubs lack of premiership success for the period between 1958 and 1990 where the club contested in 8 losing grand finals. When the line was included in 1906 Collingwood had won 3 grand finals (VFA and VFL) out of four appearances. In 1983 the line was changed to There is just one team we favour , but soon reverted back to its' original line Good Old Collingwood Forever . (Collingwood Football Club Theme Song, n.d) due to lack of support from fans (Club Songs, n.d).